Luna Volta is a plant-based wellness company committed to honoring our planet. Inspired by the Moon, the Earth, and the Stars, Luna Volta was born from time spent on the road exploring the beauty on our planet, Earth. My name is Kayla Clements, and I am the founder of Luna Volta. After spending almost a decade working in fashion, turning an internship into the career of my dreams in New York City, I began to shift my energy away from the hustle and towards my own health + wellness. I began an at-home yoga + meditation practice, began cooking my own meals and brewing herbal remedies, started surrounding myself with people with entrepreneurial mindsets, began reading and listening to podcasts more, signed up for my first 5k, and was first introduced to the benefits of cannabinoids, specifically CBD (cannabidiol). I began using CBD daily, testing various dosing methods and products. When I was unable to find a high quality brand that I connected to, the seed was planted. #vanlife journey camping, hiking, and exploring my way through nine states and twelve of America’s National Parks. From the world's longest slot canyon in the deserts of Utah to the giant old-growth trees in the Pacific Northwest to the rocky cliffs of California, Luna Volta was ideated surrounded by the natural beauty of our Earth. Standing upon the top of Glacier National Park at a “star party ” in Montana, where I was able to view the Andromeda Galaxy through a giant telescope and then with the naked eye, my appreciation for our tiny world within a vast solar system was amplified. Each day I spent on the road, my bond to nature deepened. For example, I remember my first night in Bryce Canyon National Park, UT. I scored a coveted campsite on top of a hillside opposite the canyon itself, overlooking a beautiful sunset through the forest trees. After a satisfying dinner made over the campfire, I looked behind me to find a full super-moon, hanging low in the sky, staring back at me. I reached for my binoculars and through them I could actually see the small craters on the moon’s surface. It felt like, if I reached out, I could touch it. I looked around with sparkles in my eyes and after a moment of complete silence, I erupted into a fit of hysteria. My body fell into an odd combination of jumping and dancing around the campsite and my face filled with joy and laughter. I felt so happy and at peace in that moment. I was just a small human being camping on the edge of an incredible canyon bearing witness to the beauty both within and outside of our planet, Earth. Talk about perspective. It is important to me that, as a business, Luna Volta is thoughtful in every decision we make. I am a bit of a perfectionist and there is no way I am going to put a product on shelves that I do not believe in myself. I spent five months completing my Cannabis Science Certification from Sativa Science Club, where I dove deep into the science of cannabis + hemp, the endocannabinoid system, and how the plant interacts with our bodies. Additionally, I am currently enrolled in NYU’s satellite Corporate Sustainability program to further improve our decision making in regards to sustainability. It took over a year of formulating and sourcing for Luna Volta’s first product, our premium wellness hemp oil, NOVA. My goal is for our supply chain to be as conscious as possible, to work with minority- and woman-owned small businesses, and to fully source here in the USA. -Hemp can be grown as a cycle crop to help regenerate soil for future crops. Our oil is extracted from hemp grown organically on small farms in the USA, contains 600mg CBD + trace amounts of other cannabinoids and terpenes to encourage the “entourage effect”, and is blended into an organic MCT oil. -The oil undergoes multiple lab tests, including third party, to ensure potency of cannabinoid + terpene content and to ensure there are no pesticides or residual solvents. -Our recyclable glass bottles are sourced through a pre-cycling program that intercepts unused surplus goods before disposal. Once collected, they are screen printed in CA using UV inks, which offer a low carbon footprint and require no paper labels or glue. -Our boxes are handmade in San Diego from 100% PCW and embedded with wildflower seeds beneficial to the declining bee population. The boxes are printed with soy-based inks and naturally colored with earth pigments. Yes, they are 100% biodegradable – plant them, water them, give positive affirmations, and watch wildflowers grow. -We even ship with 100% recycled shipping boxes and labels, sealing them with water-activated kraft paper tape. Along with quality and sustainability, design is just as important to me. My background is in marketing, branding, and fashion and I wanted to bring that lens to Luna Volta. If you are using a product daily, what does that experience look like? How does it affect the rest of your day? I wanted the entire experience of consuming NOVA to be conscious. -The frosted amber bottle protects against UV rays and the gold + white glass dropper elevates the bottle to look good in your medicine or smoothie cabinet, on your desk, next to your bed, or on your coffee table. -Our unique curved glass dropper makes it easier to administer oil and to retrieve every last drop from the bottle. -The oil is intended to be used sublingually for maximum absorption but that also means you have to let the oil sit under your tongue for approximately 30 seconds before swallowing. So what do you do during those thirty seconds? Personally, I use them as a mental reset to disconnect from the stress that is plaguing me, engage my senses and practice deep breathing. The entire experience brings me a sense of calm in a matter of seconds. 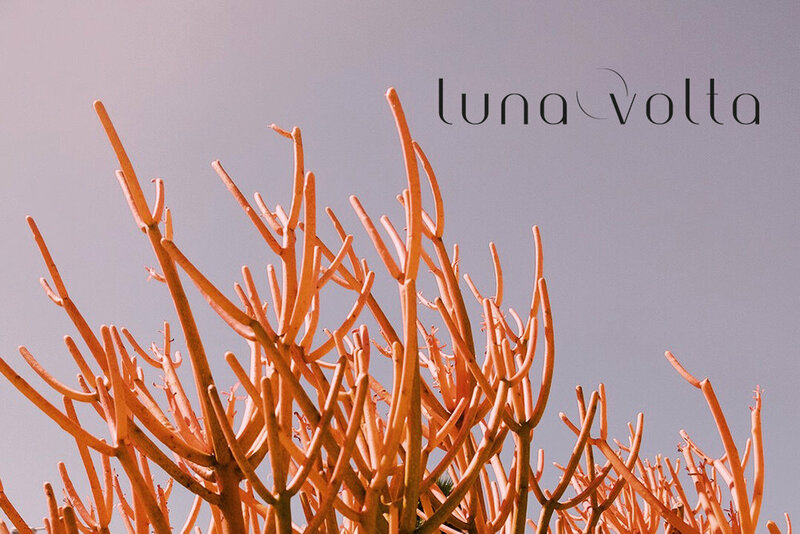 I am so excited to bring quality, design, and sustainability into the wellness space with the launch of Luna Volta. 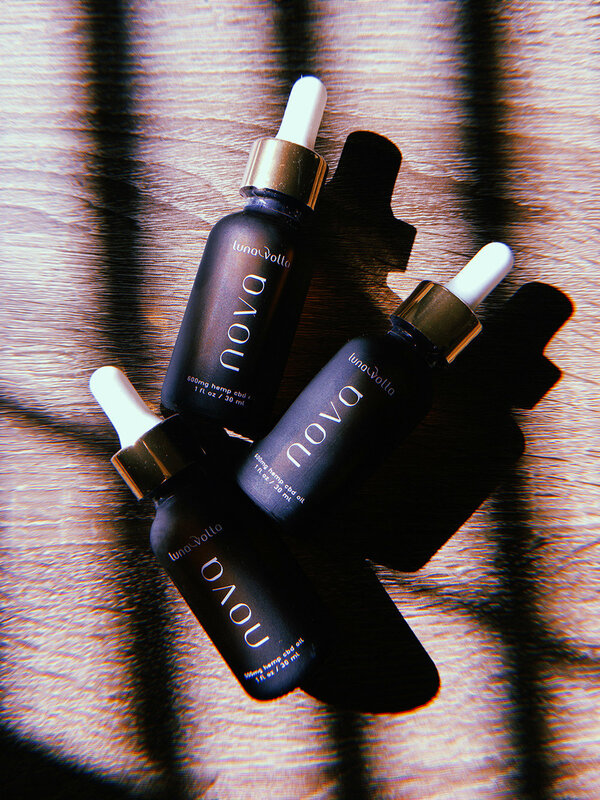 I hope you love every part of our first product, NOVA, as much as I do.